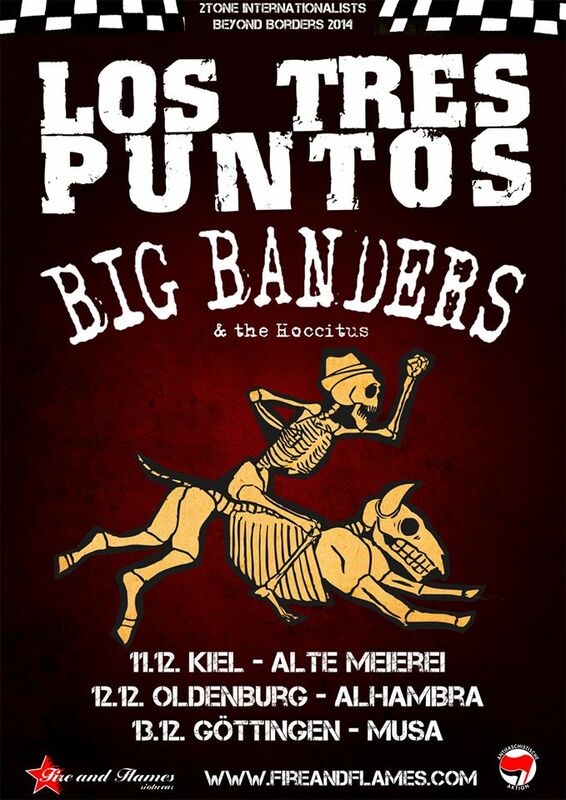 It’s the upcoming long week end that Los Tres Puntos and Big Banders will hit northern germany with a big fat dose of internationalist ska beyond borders. And even better: Your personal service providers of Fire and Flames Riotwear will accompany all the shows! So people from Kiel (11.12. ), Oldenburg (12.12.) and Göttingen (13.12.) have the comfortable chance to get their favourite shirt of the new winter collection directly in their hometown. By the way: FF is really looking forward to come back to the past homeland Göttingen, put something up together with comrades of Antifaschistische Linke International and see old mates of Rogue Steady Orchestra once again! New Releases from Rogue Steady Orchestra, Pyro One, Cobretti, and more..
*Weve just added the latest Twisted Chords releases to the site, and would like to take the opportunity to suggest them to you, as there are definitely some great ones among them. Still in the hip-hop vein Kobito (probably better known from Schlagzeiln) has just released „Zu Eklektisch,“…. Besides that, also releases from Cobretti (CD /LP) and a 7″ from Tackleberry. Also, no longer exactly new and in the category „this is a great band and a pretty good CD, its strange that we havent sold any in months……ooooohh, we never put it online“ is 8 6 Crews „Old Reggae Friends.“ First full length in over 12 years from this absolutely excellent Parisian skareggae combo. If you scroll through their section of the site, you will also notice that other designs are now again available in more sizes. *We presented the book „Work“ just the other day, and have also added the latest issues of Plastic Bomb, AIB, and Lotta in the last few days. Du browst gerade in den Fire and Flames Weblog-Archiven nach dem Tag 'rogue-steady-orchestra'.